The Arts: "Un Chien Andaloue" was a 1929 surrealist short movie made by Salvador Dali and Luis Buñuel. At the Paris premiere Buñuel put stones in his pockets "to throw at the audience in case of disaster". ZZZZZZZ was invented in 1929. And... God's Man is a wordless novel by Lynd Ward via 139 captionless woodblock prints telling the story of an artist who trades his soul for a magic paintbrush. "Once in the racket you're always in it"
Alfred Hitchcock made the first recorded "Thats what she said" joke in 1929 - "as the girl said to the soldier." Charlie Chaplin was removed as a nominee for Best Actor, Best Writer and Best Director, Comedy for The Circus at the 1929 Academy Awards. Instead he received a single Honorary Award. William Howard Taft is the only former President to swear in subsequent Presidents, giving the oath of office to both Calvin Coolidge (in 1925) and Herbert Hoover (in 1929). "Elementary, my dear Watson," is a misquote. In all sixty of Arthur Conan Doyle's Sherlock Holmes stories, the quote is never once said. It was first used in the 1929 film, The Return of Sherlock Holmes, which is not written by Doyle. In 1929 the League of Nations outlawed war via the Kellogg-Briand Pact. Lambert Field in St. Louis was the first airport to feature air traffic control. Archie League was the first air traffic controller. His "control tower" consisted of a beach chair with an umbrella. He communicated with the planes by waving a series of flags. The 1953 film Singin' in the Rain was not the first movie to feature its title song. The song originally debuted in The Hollywood Revue of 1929 and was featured in several films before Gene Kelly's famous performance. The 1929 Science Fiction Film Woman in The Moon influenced the space program as we know it today. The verbal "Countdown" used for rocket launches originated with this German silent film. Other influences include the use of a launch pad, G-force requirements, and modern multistage orbital rockets. Rocky Road became the first widely available ice cream combination flavor. The 1971 Led Zeppelin hit When the Levee Breaks is a cover of a 1929 blues song written about the Great Mississippi Flood of 1927. According to Hollywood legend, dog actor Rin Tin Tin received the most votes for the first Academy Award for Best Actor in 1929, but the Academy wanted to appear more serious and decided that a human had to win the award. The American Tobacco Company marketed cigarettes to feminist emancipators by calling them "torches of freedom." Smoking of cigarettes was "a way for women to challenge social norms and fight for equal rights as men". After the devastating stock market crash, Al Capone opened soup kitchens throughout Chicago and provided food and clothing to numerous struggling families. The Oval Office of the White House did not have a telephone until 1929. The US president previously had to use the phone in the foyer outside the office if he wanted to call someone. J M Barrie gave the rights for Peter Pan to Great Ormond Street Hospital. Texas Pete, a Louisiana-Style hot sauce made in North Carolina, was advised to be marketed Mexican Joe. The creator's father insisted the name be American. Times New Roman is a modified version of Times Roman, a font created in 1929 for British newspaper The Times. Sophia Kleegman became the first woman to be appointed to the faculty of obstetrics and gynecology at the New York University College of Medicine. Vladimir Zworykin invented the cathode-ray tube called the kinescope, which is the basis for 20th century television screens. In 1929, 23.9% of a family's income went to food, versus 10.7% in 1997. The Zildjian musical instrument company, which started in 1623 in Turkey and moved to the US in 1929, is widely recognized as the oldest family owned business in America. 'Zombie' was introduced to the western world in the book, 'The Magic Island' by W.B. Seabrook in 1929. When the soft drink 7 Up first launched in 1929 it contained lithium citrate, the same mood-stabilizing drug used to treat mania and bi-polar disorder. It was removed from the forumla in 1950. THE SAINT VALENTINE'S DAY MASSACRE - Al Capone's men allegedly killed 7 other alleged gangsters in an alleged shooting on February 14th. This would have given Mr. Capone control of Chicago's mob underworld, if such a thing, in fact, actually existed. Mobster Frank Gusenberg told police "Nobody shot me" after being shot 8 times at the St Valentines Day Massacre. During the great market crash of 1929, Albert Wiggin, the head of Chase National Bank, "shorted" Chase National Bank stock and made the equivalent of $50 million in today's money. Japan didn't sign the 1929 Geneva convention on treatment of POWs, and nearly half of all Americans captured by the Japanese in WW2 were killed in custody. The founder of the Coors Brewing Company, Adolph Coors, committed suicide by jumping out of a hotel window in Virgina Beach in 1929. Roger Babson correctly predicted the Wall Street Crash of 1929 using the unorthodox notion that gravity and Sir Isaac Newton's law of action and reaction can be used to explain movement in the stock markets. Louis B. Mayer pretty much "fixed" the first Academy Awards presentation. The 'Atlantic City Conference' hosted the 'The Big Seven Group' crime bosses. This conference organized the future of the 'National Crime Syndicate' for the next 50+ years. This why it is call organized crime. 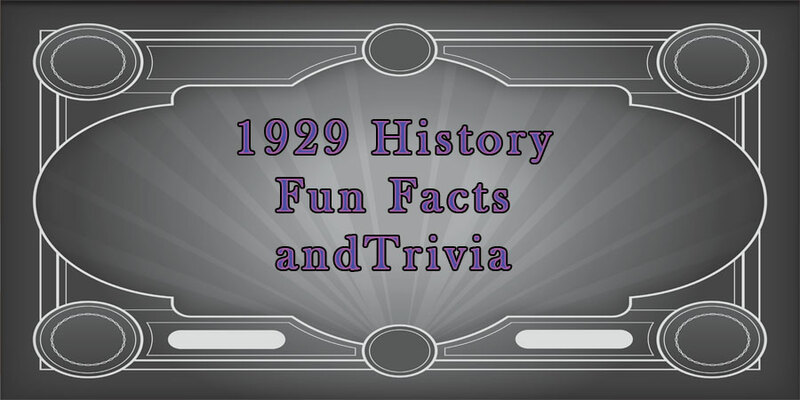 General Motors and Chevrolet were founded by the same man, William Durant, who later lost all his money in the stock market crash in 1929 and died nearly bankrupt while managing a bowling alley.